Sterling Engineering & Fabrication, Inc.
Get driving directions from your location by clicking here. • Take I-20 West out of Atlanta to Exit #11 (U.S. Hwy. 27/Bremen). • Turn left off the exit and go south on Hwy. 27 for approximately 6.2 miles to Columbia Drive (there is a Kangaroo gas station at this intersection). • Turn right on Columbia drive and go approximately 0.50 miles to Brightwave Blvd (there is an industrial park directional sign at this turn, which has our name on it). • Turn right on Brightwave Blvd. and go approximately 0.25 miles to Automation Drive. • Turn right on Automation Drive and go 0.10 miles to Jerry Dowd Drive (formerly Performance Way). • Turn left on Jerry Dowd Drive. We are the only building on the left. 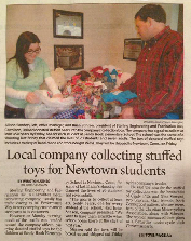 In 2012, Sterling Engineering & Fabrication made headlines for their “Teddy Bear Drive,” a benefit they assisted with for the students at Sandy Hook Elementary in Newtown, Connecticut, after a fatal shooting.